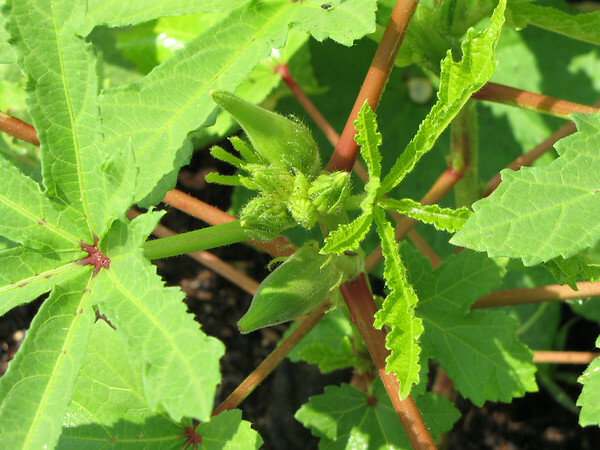 The first time I planted okra was in a small box garden in my front yard. Being from more Northern climes, I had no idea what the plant or flowers would look like. I was surprised to see holly hock type flowers, a deep purple interior with creamy exterior. Alas, these plants grew to be fifteen feet tall–and I could not even begin to reach the pods for harvest. Then I started looking for shorter versions–and found Clemson Spineless. This year my garden got rather a late start and the okra only grew to about eighteen inches tall. So far I’ve had enough pods for two meals for me–not enough to put away for the winter but there is still plenty of hot weather to come.